I joined Anderson & Sheppard as a client consultant – the front of house – a few months ago. One of the first things you have to get your head around is how the ordering and administration works here, getting the cloth in and learning the systems. 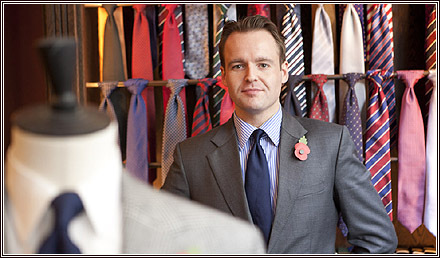 I was at Thomas Pink for six years, two in the Jermyn Street store and then four at head office in Battersea. I looked after all the made-to-order services, whether that be in London, Paris or New York. I dealt with everything from training the staff to ensuring delivery in the store, organising the logistics and supplies. There was a fair bit of hands-on work in that role too though, particularly on the few road shows I was involved with. The most recent was in Mexico. We were out there for a week, introducing the new franchise store that had opened, meeting the press and taking measurements from customers. Myself and a colleague also did a lecture at the university on British style – it holds such fascination for non-Brits. We took them through the history of the shirt, how it has involved and things to look for in modern shirts. It was a great experience.